I want to remind everyone about book week, every child a reader, coming up May 7-13, 2012. You can go to their website, http://www.bookweekonline.com/, and learn whether there are any events in your city or if you just want some bookmarks. I just found out a book festival is being held in a city fairly close to me in Gaithersburg Maryland and I may just go for the fun of it. From the web site, it looks simply marvelous. Now on to Perfect Picture Book Friday. Resources: Wikipedia has a page describing the book and explaining the tales in detail, I found some interesting facts about the book that I hadn’t understood when reading it. One needs to be well versed in the fairy tales to understand this book. Coming from Holland and not having parents read to me, I found this page helpful. http://en.wikipedia.org/wiki/The_Stinky_Cheese_Man_and_Other_Fairly_Stupid_Tales. A family theatre company is putting on a show in Dayton about it here: http://mostmetro.com/performing-arts-theater/previews/the-stinky-cheese-man-and-other-fairly-stupid-tales.html for 2012 season. Another theatre http://www.schooltimeseries.com/webpdfs/ST_StinkyCheeseMan_web.pdf gives lessons in language arts and media to give before a field trip there. This resource is the main one for teacher guides about the book. There is a whole pamphlet called Dreamcatchers with a description of the show including fun facts and discussions for pre and post performance based on the book. 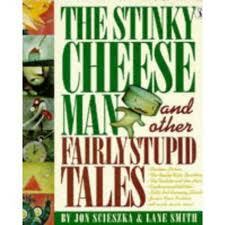 After looking at all the activities I realized that kids need to have a basic understanding of fairy tales to enjoy this book so I recommend reading The Stinky Cheese Man after a program of reading the fairy tales included in it. Then after the kids have learned the fairy tales a parody such as The Stinky Cheese Man will make the most sense. Why I love it: This book appeals to all kinds of kids with its acute sense of humor, especially boys, I would think. It would appeal to kids who have had some experience with being read to and know the fairy tales so I’ll venture to say older ones, and ones who can read it to themselves as well as still enjoying being read to. The reason I say a child will enjoy reading to themselves is because there are so many jokes about spelling and so many puns about the way they have been taught things should be. It is one big joke, starting with the title as you can see. The tales are all fractured and in a way that makes one think about the first telling, wondering if in another perspective the tale is even more provocative. For more books with resources please visit Perfect Picture Books at Susanna Leonard Hill’s blog. This is what Susanna says about it. “We all want to introduce our children to the joys of books, and encourage them to be life-long readers. So much of that is dependent on finding the right books to suit their individual needs and interests. The marketplace can be overwhelming and sadly, not all of us have time to go and chat with our local children’s librarian or spend hours researching books. Perfect Picture Book Fridays and Just Right Books will be your new resource – a community of parents, teachers, librarians, and writers whose recommendations you can trust, and a way to make life easier for parents and teachers.” So you see, I am a small part in all this and hope you enjoyed this review as much as I did writing it. I hope parents and teachers can find what they need with less searching and save time by going here. 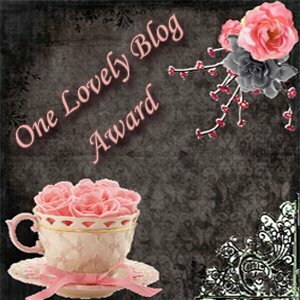 We need to market this blog for this very reason. Thanks for reading. Would you read the book, Stinky Cheese Man and Other Fairly Stupid Tales? This entry was posted in blogging, Clara Bowman-Jahn, Clarike Bowman-Jahn, Course or Book Review, social networking and tagged Jon Scieszka, Lane Smith, Perfect Picture Book Friday, Picture book, Susanna Leonard Hill, The Stinky Cheese Man and Other Fairly Stupid Tales. Bookmark the permalink. Great choice Clar, my kids love that book. There’s so much going on you could never get bored. My post doesn’t know it’s me answering and I had to unspam it and answer again. 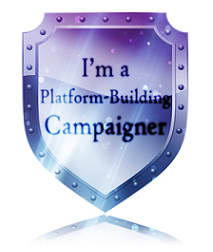 You are a BIG part in this PPB venture Clar, not just a small one 🙂 Thanks so much for sharing this book. I can’t believe no one had put it up yet, it’s such a great one! I love humorous books!!! Aaww thanks, Susanna. I appreciate your kind words. Apparently my comments are going into my spam folder. And to get it out I had to retype something. so here goes. This book is awesome and I am so glad you added it to the list! It goes hand in hand with Squids Will Be Squids (also by Lane Smith and Jon Scieszka) You are right about a general familiarity with fairy tales being necessary to enjoying this book. Thank you! This is a brilliant book…. I love this humour and word play!. Great choice, Clar! I guess I’m the only one who has not heard of this one — although I grew up on fairy tales and folklore. Sounds like a very unique book that I want to check out at the library. Like that is is full of humor. Great choice. Can’t go wrong with the authorand illustrator! Thanks for sharing! We would read it! Thanks for adding it to the list. Oh my gosh, this looks hilarious! I love comical books. Terrific Friday line-up as usual, mate. Love that Stinky Cheese title too. Great job, mate. All Googled-Xed, Facebooked and Tweeted. Thanks, Margot. And thanks for all the promotion of this post, too. I must look you up on face book. 🙂 I don’t do Google Plus. I can’t seem to find the time. Clar, Google+ is better than Facebook. You can have circles for friends, writers, bookstores, teachers, librarians – whatever you need for friendship, family and promoting stuff. 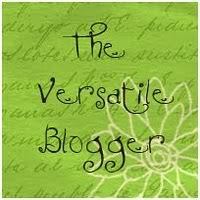 I put your Friday blog on Teachers, Librarians, Writers and the general list. With GoogleX you only send to names that will be interested in a particular post. The Stinky Cheese Man was one of my favorite books to read to my boys. I’m not sure who enjoyed it more, them or me. 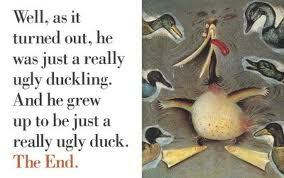 My now 25 year old recently asked me if I could remember the name of the book with the funny stories. I couldn’t then, but now I’ll let him know. Thanks. When I taught, my third graders loved this book. Too funny! This is one of my FAVORITE books! It makes me laugh. Great choice! Definitely hilarious. My kids laugh all the way through. Great choice, Clar! I love this book. It has so much humor and I love the illustrations. I am so glad it’s on the list. The illustrations are definitely different aren’t they?